Example of a typical horizontal axis tidal turbine. ABB Ltd has secured an order in excess of £2 million for the engineering, supply, installation and commissioning of an electrical generating system for two tidal turbines, rated at 2.4 MW. 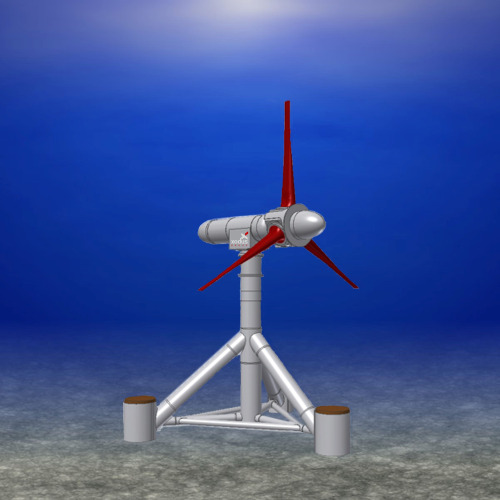 The high tidal energy environment required to provide the input to tidal power devices presents a combination of design and installation challenges. Andrew Small and Greg Cook of energy consultancy Xodus Group examine the issues. Though still very much in its infancy, tidal energy is gaining momentum. In 2006, the first test rig turbine was installed and generated electricity to the UK grid using OpenHydro prototype. Seven years on, the Meygen project in the Pentland Firth is planned to be the UK’s first commercial tidal project, initially comprising six turbines with a total installed power of 9MW with planned further expansion to 86MW. Unlike offshore wind, which has seen huge investment from major energy companies, smaller developers and intelligence investors have been the key players in this emerging market. Despite limited capital, a number of Tidal Energy Converter (TEC) devices have now been installed at several locations around the UK. The primary design challenges inherent in high tidal energy environments include geotechnical uncertainties. For one, the bedrock geology of the UK coastline is complex and varies significantly across the country. From Precambrian age well indurated marine sedimentary rocks such as sandstone, limestone and shale in the West of Scotland, and indurated slates and schists around the Welsh coastline, a variety of basement type materials need to be considered for foundation design. In addition to this basement geology, a thin veneer of unconsolidated coarse sediments often blankets these materials. Site investigation of tidal turbine environments can be extremely difficult and challenging; hence geotechnical design and installation elements pose a major risk to the project unless properly considered and effectively managed. Jagged hard substrates often present challenging seabed profiles (see rendering) to design around and where typical seabed preparation techniques, such as rock carpeting or dredging, may not be practical or feasible. In order to promote efficient design and realise cost savings, a comprehensive site investigation program should be developed. Ideally, this should begin with a detailed desktop study, shore site walk-over and geophysical and visual camera survey for initial investigations before moving to more complex and costly geotechnical surveys comprising potentially onshore, nearshore and offshore drilling. A detailed geophysical survey combining surface and subsurface techniques, such as multibeam echo sounder, side scan sonar and sub-bottom profiler, are essential to understand the topography of the development area to select and optimise not only the location of the TECs, but also the lay routes of inter-array and export cables. The aim of such surveys is to identify hazards whereby potential mitigation measures may need to be developed. Geotechnical data to deeper depths (~20m to ~30m below seabed) may be required to perform a detailed foundation design to address such issues as foundation capacity, soil-structure interaction and install ability. Whilst offshore geotechnical drilling can seem expensive, the data can potentially be further supplemented by data from an onshore drilling campaign which will allow for further laboratory tests to be carried out in an attempt to better understand the variation in the properties of the bedrock and their geotechnical characteristics at a fraction of the cost of any marine investigation. Additionally, material specific research on soil-material interface friction may also to promote efficient foundation designs. Acquisition of appropriate data to coincide with appropriate project milestones will culminate in a comprehensive understanding of the geological features and geotechnical conditions relevant to design. Initial design evaluations typically use geotechnical parameters derived from qualitative descriptions of shore geology and from camera surveys, thus resulting in potentially very conservative foundation designs to safely accommodate the uncertainty in site conditions and seabed materials. As a result, base structures may grow significantly in size and cost. Whilst this may be acceptable for front end engineering design (FEED) considerations, it may lead to issues with certification during detailed design whereby optimisations are actively investigated. Currently, the design of each tidal turbine varies significantly between manufacturers; hence a wide variety of foundation systems have been installed to date, including: drilled and grouted monopiles, pin piles and gravity-based solutions. The foundation solution is typically governed by not only the seabed conditions, but also the TEC design which may limit potential foundation solutions to a challenging environment. Selecting the appropriate TEC to both the seabed and tidal conditions is key to effective project development. Together with smaller demonstrator sites, the European Marine Energy Centre (EMEC) test site off the coast of the Orkney Islands has provided a catalyst for innovation into wave and tidal energy research. Appropriately, EMEC is located near the treacherous Pentland Firth which boasts high velocity marine currents and challenging geomorphology. Reports suggest that the Pentland Firth area alone could theoretically generate around 1.9GW of tidal power. Examples of currently installed demonstrator sites around the UK include: Marine Current Turbines (MCT) SeaGen device installed in Northern Ireland’s Strangford Lough in 2008 that utilised a novel foundation installation approach. A quadrapod design base was temporarily ballasted for stability onto which a temporary work deck was installed on top of the turbine structure above water level. In a similar manner to the OpenHydro device, this allows the turbine assembly to be raised above the sea surface to realize reduced maintenance costs. Additionally, in mid-2011 Voith installed the foundations for their prototype HyTide 1MW device at the EMEC test site. Unlike SeaGen and OpenHydro devices, which protrude above the sea surface the device is completely submerged. Possibly the most conventional design of TECs are those which feature large gravity based or piled tripod foundation configurations similar to those sometimes used at German wind farm sites. A prototype HATT with a gravity-based foundation solution is depicted in Figure 2. Typically in shallow seas (<200m water depth) pipelines and cables laid across the seabed are protected by being placed into a trench or covered with crushed graded rock. Cable casings are also sometimes utilised to provide protection. This protection serves multiple purposes, including fishing gear interaction, dropped objects and anchoring. It also ensures on-bottom stability from hydrodynamic forces. The extent of product protection will likely be selected based on protection philosophy, the requirements of other sea users and the level of risk the developer is willing to accept. The decommissioning aspects are key design considerations for new offshore developments and should be considered early in the design phase to minimize future environmental impact, offshore activities and associated costs. As the installation of tidal turbines is typically remote, it is presumed that decommissioning will also take place remotely. In 2011 the Department of Energy and Climate Change (DECC) published guidance notes on decommissioning of renewable energy installations, including some brief guidance on the removal of foundation elements and cable deburial. A detailed assessment of the recovery loads of a structure placed on a seabed for a typical 20-year design life requires careful consideration to determine the additional loads arising from marine growth, seabed suction and potentially cementation. Additionally, careful consideration of the capacity of any existing lifting points intended for re-use would be required. At present there are few recorded cases of recovery of large, gravity-based subsea structures after long periods of use. However, it is likely that as North Sea decommissioning activities pick up pace, these will be better understood in the coming years. Extreme environmental conditions and complex geotechnical challenges make the development of tidal energy projects a huge undertaking. The ambition for tidal to become a viable and reliable source of renewable energy for the future continues to require significant financial and intellectual input; however, the challenges are being overcome and solutions found. As part of this it is important that a thorough understanding of seabed conditions and materials are adequately investigated prior to deployment to minimize project risk of such complex and innovative devices. Whilst the design of each device varies significantly between manufacturers, each type of device has the same fundamental issues to resolve from concept to project sanction, through asset integrity to end of life. The Meygen project, as the UK’s first commercial initiative, could prove to be turning point of the tidal industry.